Situated in the heart of Topsham, The Salutation Inn has been providing bed and sustenance to sailors, travellers and revellers for nearly 300 years, with Tom and Amelia Williams-Hawkes at the helm for the past five years. Tom is the Chef Director, having previously worked alongside Michael Caines, Gordon Ramsay and Marcus Wareing. With six renovated bedrooms and a high-reputation for gourmet feasting, The Salutation continues to be the go-to destination for celebrations and special occasions, while their GlassHouse is the perfect daily escape for coffee, cake and afternoon tea. Red gurnard is a firm fish, with fantastic flavour. It’s one that we should all be eating more, as gurnard is often discarded due to low market demand. Once you try this recipe though, you’ll want to add it to your repertoire, as this tasty dish never fails to impress and can be prepared well in advance as a starter or main course. Escabeche is simply the Spanish word for ‘pickled’ and usually refers to fish that has been fried first, then marinated in a flavoured vinegar. In a shallow container, combine the olive oil, garlic, lemon juice and lemon thyme. Then, season the red gurnard with a little Cornish sea salt and ground white pepper, while you bring a frying pan up to a high heat. Pan-fry the fillets in a little of the olive oil, approximately 3 minutes on the skin side, 1 minute on the flesh. Once cooked, remove and place into the container of the remaining ingredients and leave to infuse. For the escabeche, gently sweat the onion and garlic in the olive oil in a low heat so it cooks without colour. Add the carrot and once both are just cooked, add all the remaining ingredients. Allow the mixture to come to the boil, then remove from the heat. 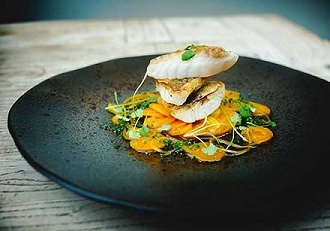 To serve, spoon the escabeche in the centre of the plate, then place the red gurnard on top. Finish with a little dressed salad. Enjoy.